A native of Canada, Christie was a highly-sought soccer prospect coming out of high school but was recruited by William & Mary to be a kicker. He set school records for field goals (57), field goal percentage (68.7), and points (279) and was also an accomplished punter. For his efforts, he was a three-time All-ECAC selection. Undrafted out of college, Christie joined the Tampa Bay Buccaneers in 1990 and was successful on 23 of 27 field goal attempts. He received first-team All-NFC honors from UPI and Pro Football Weekly. After a second season with the Bucs, he signed with the Bills as a free agent in 1992. Christie connected on 24 of 30 field goal attempts in 1992 and was 9-of-10 in his first postseason, which included the game-winning kick in the dramatic come-from-behind win over the Oilers in the Wild Card round and five in the AFC Championship against Miami. A lesser year in ’93 was followed by his career high for field goal percentage (85.7) in 1994 as he made good on 24 of 28 attempts and kicked a Super Bowl-record 54-yard field goal in the postseason. He remained consistent and in 1997 was 24-of-30 on field goals (80 %) and was successful all 21 of his extra point attempts. Bills went 10-6 to finish third in the AFC East and qualified for the postseason as a Wild Card. Lost AFC Wild Card playoff to Miami Dolphins (24-17). Christie spent two more seasons with Buffalo for a total of nine before a preseason groin injury in 2001 led to his being placed on injured-reserve and then released. 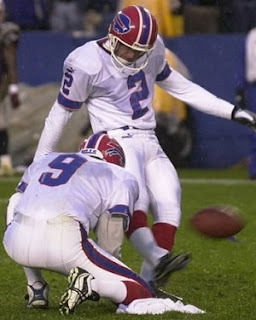 He departed the Bills having achieved franchise records with 234 field goals out of 299 attempts (78.3 %) and 309 extra points, with four misses, for a total of 1011 points. Christie joined the San Diego Chargers during the 2001season and stayed on for another two years before finishing his career with the Giants in 2004. Overall, Christie was successful on 336 of 431 field goal attempts (78.0 %) and 468 of 473 PATs for a total of 1476 points.